Honda Beat - J's Garage Export Co., Ltd. 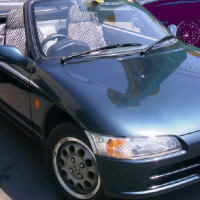 The Honda Beat is a small midship engine layout 2-seats convertible car. The Honda Beat might be not a serious performance car, but it does have a high responsive modified E07A engine. The small 660cc SOHC 12-valve MTREC (Multi Throttle Responsive Engine Control system) engine makes 64 horsepower at 8100 rpm. And the manual transmission shifts smoothly and can be fun to operate. Also handling and ride comfort are surprisingly good. The Honda Beat is equipped with MacPherson strut front and rear suspension , and all-wheel disc brakes. Various limited edition versions of the Honda BEAT are introduced. 1992.02 : The Beat Version F features Aztec Green Pearl color and alloy wheels. 1992.05 : The Beat Version C features Captiva Blue Pearl color and alloy wheels. 1993.05 : The Beat Version Z features Blade Silver Metallic color or Evergrade Green Metallic color, three black gauges, mud guards, a rear spoiler, exhaust pipe finisher, and alloy wheels. Main Equipment : Air conditioning, Power window, 3-point seat belt, Sun visor, Front stabilizer, Front laminated glass, Side toughened glass, Halogen head lamps, Soft top, Steel wheels.